Will there soon be an Everyman on every corner? THE Everyman has a reputation as a uniquely Hampstead institution, an independent cinema showing art house flicks alongside more staple Hollywood fare, with posh nibbles, luxurious sofas and pricey tickets. But now Everyman Media Group which owns the cinema in Holly Bush Vale is set to break out of the village and open new cinemas on high streets across the UK. The group’s chief executive, Daniel Broch, announced last week that a long-term plan to buy out the Screen Cinemas – six theatres that include the Screen on the Hill in Belsize Park and the Screen on the Green in Upper Street, Islington – has been completed. In a multi-million pound deal – rumoured to be £7 million – Everyman Media has bought freeholds on some of the six sites. It is just the first step in a massive expansion plan, according to Mr Broch. He plans to open 50 cinemas in 10 years across the UK. The Screen group first opened their doors in 1970 when proprietor Romaine Hart, managing director of Mainline Pictures, took over the former Rex cinema in Upper Street. She acquired the Screen on the Hill in 1977. It is a model, she says, that has been so successful it has been copied across the country. To fund the takeover, Everyman Media has brought in outside investors, the most high profile being Lloyd Dorfman. Mr Dorfman, who lives in Hampstead, owns the Travelex money group and has bankrolled a cheap ticket scheme to the National Theatre. He also sits on the board of the Jewish ­Community Centre. Other backers include pizza entrepreneurs Sam and Adam Kay, who run the ASK Italian restaurant chain. Mr Broch bought The Everyman in 2000. It had gone bankrupt twice and he originally saw the purchase as merely a property deal. He planned to use the upstairs as office space and run a bar in the basement to help pay the bills. But rather than close the cinema he decided to see how it went for six months or so – and ended up deciding he could make a go of it. 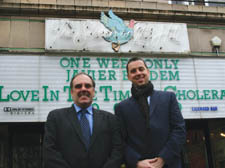 Now the Everyman is regularly sold out – something that Mr Broch aims to achieve with the Screen chain.